A few weeks ago, HQ hair kindly sent me some nail polishes to take part with a nail art campaign that they were running. I've tried out a few different looks on my nails, and despite being a bit wobbly of hand, have been pretty pleased with what I achieved! 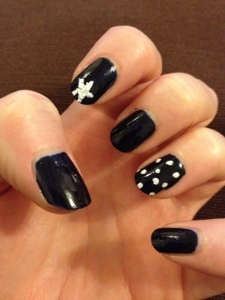 The first look I created were some white on navy feature nails. The white polish that I was sent was actually meant to be a crackle polish but unfortunately it didn't want to crackle, so instead I used it to created a small star design and also a polka dot look, which I think work really well over the navy polish. My second look was a bit more adventurous and I decided to test out my freehand line drawing skills! I used three polishes to create this look - a pastel blue, a pink and a deeper greeny/blue. I used the pastel blue as a base coat, and then built up the stripes individually, allowing each one to dry before adding the next. Despite a few of the lines being a tiny bit wobbly, I was quite pleased with how it turned out. 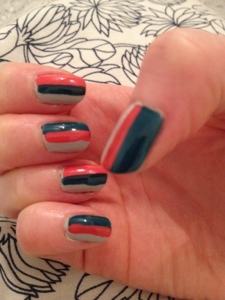 I'm planning to do a few more nail art looks over the next few weeks, and get as adventurous as possible! I was given the WAH nails book as a birthday present, so shall be looking to that for some inspiration! 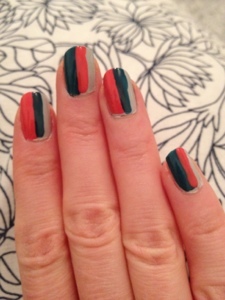 What are your favourite nail art looks?